Join us on Saturday, April 13 from 5-8pm for a Corn Hole Tournament. No idea what Corn Hole is? Check this VIDEO out. All proceeds will benefit the Student Ministries Mission Trip this summer to Camp Sunshine in Kentucky. Cost is 20/team. Forest Park will provide a main dish and we encourage you to bring a side dish or dessert to pass. Our High School group meets on Sunday nights (6:30-8pm). We alternate between small groups in homes by grade, and large group time in The Student Center at church. Wondering what to expect? Worship, laughter, helpful teaching, great discussion, and a welcoming atmosphere. We also enjoy weekend retreats and summer trips for extra time and experiences to help our students connect with Jesus and each other. Our sixth through eighth grade group meets on Wednesday nights (6:30-8pm) in The Student Center and gym at church. We spend time laughing and playing together before we dig into what it means to be a part of God's family. Every grade has a small group where we grow closer to God and each other as we share life together. CORE Class is beginning on Sunday, September 16! We cannot wait to see where this years journey takes our students and their mentors as they explore their faith together. Stay tuned throughout the year for updates! Each year on Sunday mornings we offer an intensive program that our eighth grade students can take alongside a mentor to discover the core teachings of their faith. Paired with great learning experiences, service opportunities, and more this is a great chance to grow in faith in God, and community! 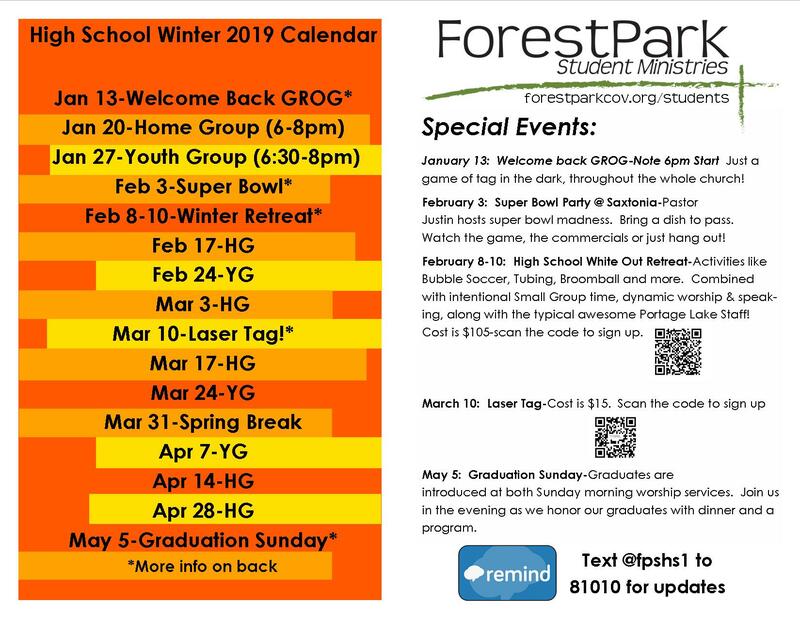 For more info please read the CORE Parent Letter and explore the 27 Foundations of Faith the CORE class explores throughout the year. A big part of Student Ministry is summer camps and retreats throughout the year. During the summer, fall, and winter you will have the opportunity to send your students up to Portage Lake Covenant Bible Camp. We have partnered with Portage Lake for many years and feel strongly that the experiences they have at camp will make an impact on their spiritual formation. The summer camp schedule is available HERE. If you want to sign up for camp please go to portagelake.org. If you a have any questions about camps at Portage Lake please contact Pastor Justin. fp students info & updates! We want to communicate with you as easily and effectively as possible. To do that we use the Remind App to send info and updates right to your phone. It's easy to sign up, just follow the directions below. Once you do, you will get up to date texts with any Student Ministry info and updates!